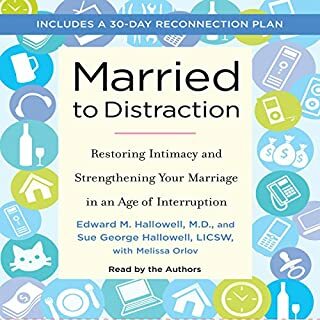 An invaluable resource for couples in which one of the partners suffers from attention deficit hyperactivity disorder (ADHD), this authoritative book guides troubled marriages toward an understanding of and appreciation for the struggles and triumphs of a relationship affected by it and to look at the disorder in a more positive and less disruptive way. Going beyond traditional marriage counseling, this discussion offers advice from the author's personal experience and years of research and identifies patterns of behavior that can hurt marriages - such as nagging, intimacy problems, sudden anger, and memory issues - through the use of vignettes and descriptions of actual couples and their ADHD struggles and solutions. This resource encourages both spouses to become active partners in improving their relationship and healing the fissures that ADHD can cause. this is eye opening. If you are an adult with ADHD or a spouse of an adult with ADHD. You must take the time to listen to this. It hits every aspect of a relationship and how ADHD has effected it. I purchased this book after a breakup of a 9 year relationship. I had also had a divorce many years ago. This book blew my mind. Chapter after chapter, I found most references in this book applied to my long term relationships. So strongly in fact I was brought to tears over and over, sobbing. I was unaware my ADHD played such a huge negative role in my relationships. I was floored. 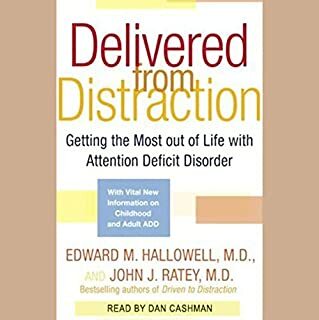 If you have ADHD or have a partner with ADHD you unequivocally NEED to listen to this book. It is an eye opener and hopefully it will set you and your partner on a road to recovery. I love you Konstantza and hope you will have me back so we can have a new relationship with all of the joys we are supposed to have. ADHD spouse here, I finally feel like I have a plan to salvage the little bit I have left in my marriage! I am so grateful this book is Finally on audiobook. I have a hard copy and have had it for several years now. I've been married for nearly 11 years. The beginning of the book almost exactly described the downfall my marriage has been going through. The fact that Melissa so perfectly describes what I've been through and does so with logic and compassion. She does a wonderful job explaining in a way that keeps me from feeling inept as a spouse. The concepts are simple and a great summary recap is at the back of the book. Thank you Melissa, I haven't felt this much hope and confidence that I can build a foundation within the ashes of my currently failing marriage. If you are reading my review and either one or. Out of you have adhd in your marriage. This is a really solid plan that sounds like it's going to work! Only the Bible is bigger in my book! Melissa-amazing. Laura-well done. My ADHD thanks you! I turned to this book after my wife of 9 years had multiple affairs over the last year. When I started listening to the book, it was a mirror of my marriage. I had thought I was ADHD most of my life but never addressed it. I asked my dr about adderrall 3 years ago which he wrote a script and although it helped for some time, well as I said I recently found out about affairs. When I realized that ADHD symptoms could be the cause for the space between us (multiple examples) I seemed out help from an adhd specialist. I was formerly diagnose with ADHD and a serious case of it. 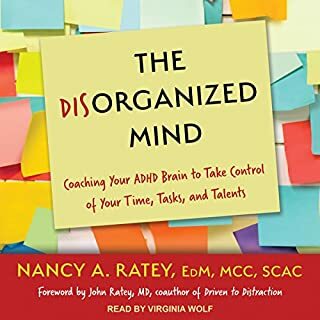 For the last two months I have been working on myself and I have a new awareness that my first path of thinking is my ADHD and through the tools in this book and journaling my thoughts, I now now how to get to my second path of thinking. 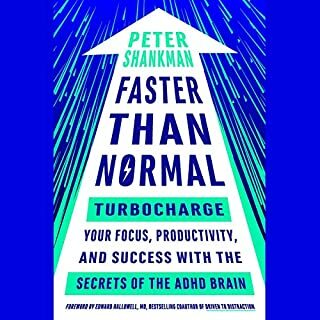 If you think you have ADHD or your partner does, read this book! I wish I could get my wife to read it but I haven’t been able to get her to. Although were working on our marriage through counseling, this book was was unlocked my mind and provided me with awareness. I can never go back to my old way of not being aware. This book may have changed my awareness forever... now to make change. Thank you. As far as the narration is concerned, I felt it to be too fake and robotic; lacking personal connection. As a result, I found it to be difficult to stay tuned in at times as the translation fell flat. Very insightful and eye opening. This has inspired me to get help and make a change. I need to be better and this book gives me hope. Accurately, and painfully, portrays what the ADHD individual and their spouses experience. 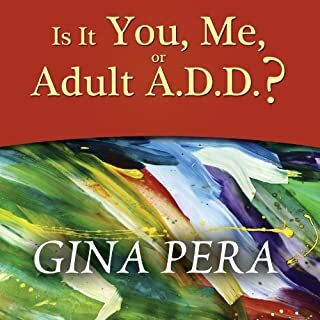 Along with the real negatives, the book offers practical guidelines on how to deal with, embrace, and even celebrate the challenges of ADHD and the uniqueness they bring to relationships. The content in the book is wonderful. However, it took me awhile to get into it because the narrator is very robotic. I would say half way through I was really able to listen and got used to the voice. Spectacularly good, accurate, fair, eye-opening, and as touching as it was refreshing. 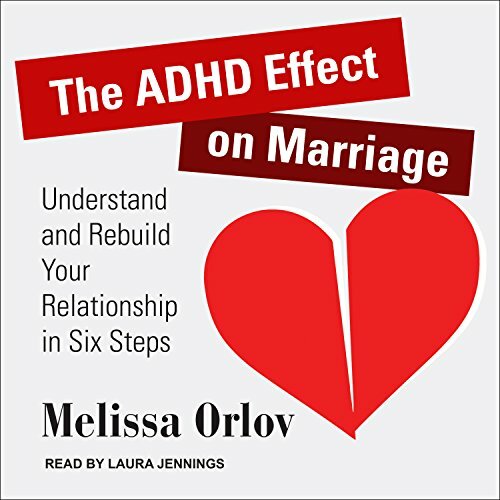 It's clear Melissa has an abundance of knowledge on adhd and relationships, but what's great is that so many principles discussed can be applied to all relationships too. Only downside was that sometimes the things that the 'adhd spouse' (I.e. husband) did were described as being an issue in the relationship due to his adhd, or things an adhd husband that affected his spouse was generalised to be because of his adhd/symptoms. However, I feel that many examples of the dissatisfaction by their non-adhd wife were more due to gender differences than given credit for. As an adhd spouse and wife myself I actually related to the non-adhd wives quite often, and my non-adhd husband (and yes, I'm sure he doesn't have it too) has a lot of similarities with the 'adhd spouse', and I feel he probably just has that in common with them due to his gender. For example I am not able to focus well off meds, but not paying my husband enough attention has never been an issue, if anything off meds I pay him too much attention. It likely comes easier to me as stereotypically females naturally prioritise family, loved ones and relationships higher, so to say adhd partners should prioritise paying their spouse more attention neglects to take this into consideration. However, Melissa does preface the book by saying that most often it is non-adhd wives that want help regarding their adhd husbands so her books are tailored exactly to that. 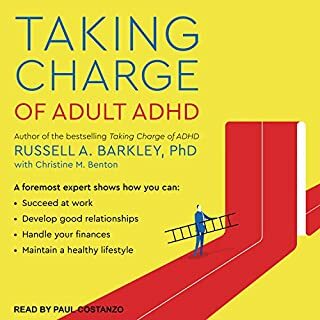 The book is absolutely invaluable either way, regardless of who has adhd. Thank you!